Flooding has hit the 2014 Winter Olympic host city of Sochi. The equivalent of more than two months’ rain fell in less than 24 hours. Storm sewage drains have overflowed, emergency measures were introduced and residents have been evacuated. The airport was the only transport hub that didn’t cease operations, although it was also affected by flooding. On Thursday morning, June 25, heavy rains began falling in Sochi and by the middle of the day 60 houses were flooded, the pumping station that carries water to the nearby villages was stopped, trains were delayed and the evacuation of residents began. More than 350 people were assigned to alleviate the effects of rainfall in Sochi, including rescue officers of from the Ministry of Emergencies, Russian news agency TASS reported. The fire department from three nearby districts also provided assistance. Anatoly Pakhomov, Sochi’s mayor, said that the storm drain system built for the Winter Olympics was inadequate in handling a disaster of this scope. According to him, the builders did not make any mistakes. “The drainage, designed according to every rule, turned out not to be prepared for the volume of rain that fell this morning,” he said. But some residents blame the builders of Olympic facilities for what happened. The editor of BlogSochi, Alexander Valov, told Gazeta.ru that the terrain is such that the water is collected in the lowlands and floods houses. Igor Yepifanov, an expert on drainage systems and a former Mosvodostok (the state enterprise responsible for the sewage system in Moscow) specialist, explained that systems to drain water are build according to the average data of rainfall, as no one orientates them toward maximum capacities. Yepifanov suggested that unauthorized structures compounded the difficulties with drainage. The only transportation hub that did not cease operations during the disaster was the airport. However, Alexander Neradko, head of the Federal Air Transport Agency (Rosaviatsiya), noted that it did flood to some degree. In order to avoid a similar situation in the future, proposals were made at an agency meeting to build additional protection for the airport in the form of a dam or ditch, given the strategic importance of the facility for the region. The press service of the company Basel Aero, which manages the transport unit, said that the airport was operating without any restrictions from 13.00 on Friday. The press service explained that climate changes and the complexity of the area’s terrain also played a role. 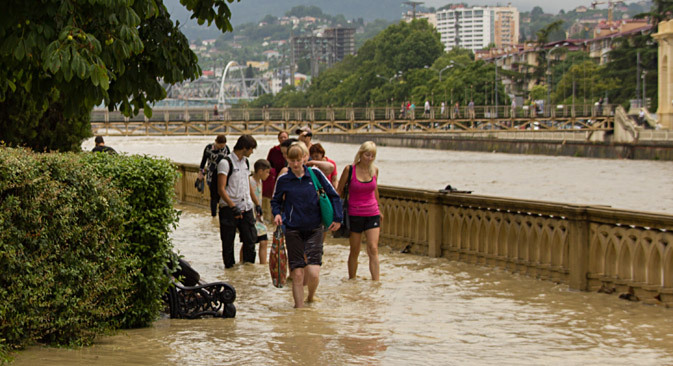 Sochi was not the first Russian city affected by heavy rains in the last few days. Kursk, Lipetsk and Moscow all went under water earlier in the week; Krasnodar Territory and the Urals were also affected by downpours.